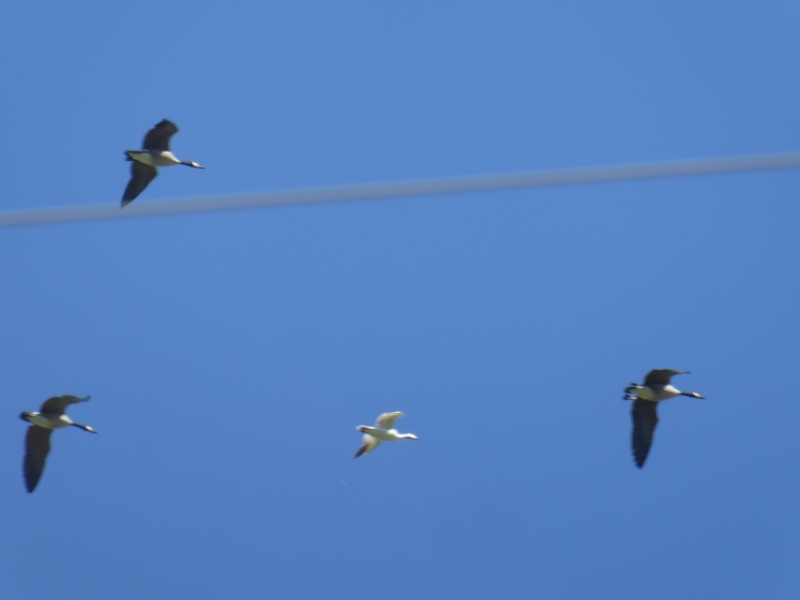 A couple days ago as Don and I were driving out, he glanced up at some approaching Canada geese flying in a classic V-formation. "That's a nice-looking flock," he remarked. But as the flock got closer, we noticed something unusual: a white bird flying amidst the grey/brown Canada geese. I snatched my camera and managed to get a shot. 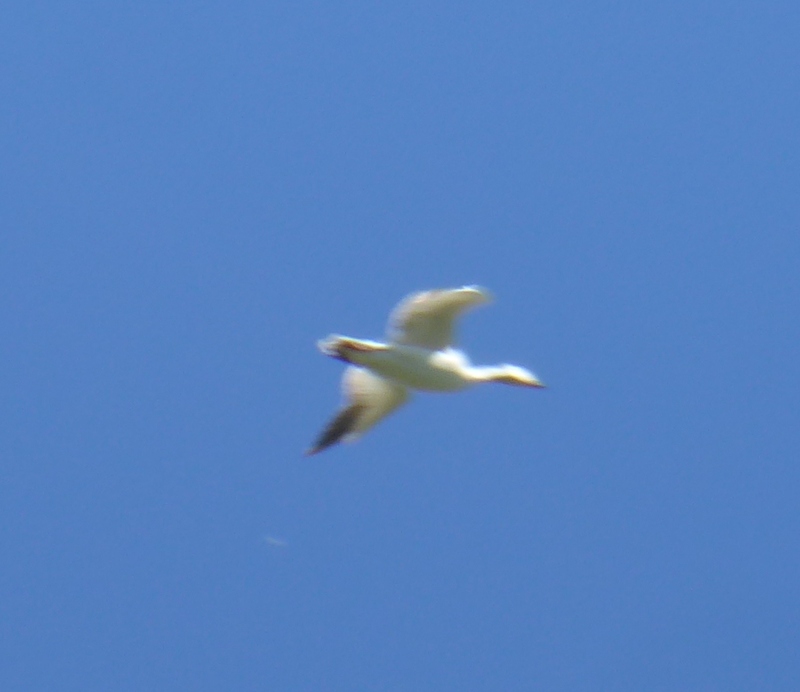 I believe the interloper is a snow goose. Mixing species is certainly nothing unusual. A few years ago in November or December (I forget which), I was driving down our two-mile dirt road on the way to town. At a low spot, I braked to allow a small flock of turkeys to walk across the road. I had to rub my eyes and take a second look, because there in the midst of the turkeys was ... a pea hen. 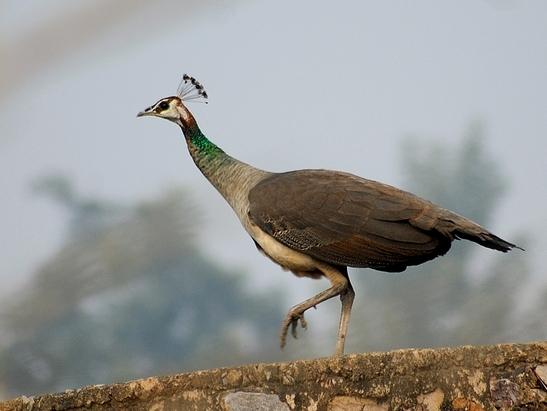 As in, a female peacock. In north Idaho. In early winter. Just walking calmly with the turkeys. I guess if you're all alone in the world, you'll grab whatever company you can. Safety in numbers, even they get it. I was stopped at a stop sign in a suburban residential neighborhood once and saw a large flock of sparrows hopping between a chain link fence and the ground. They were chittering and fluttering and interacting in what seemed a happy and energetic family gathering. Very cute. Then I noticed among them were four blue and yellow parakeets. They seemed welcome among the dull brown and gray sparrows, interacting no different, picking seeds from the grass then fluttering to the fence. It was nice that the sparrows had adopted the bright homeless friends, but sad that I knew there was no way the parakeets would survive the cold Colorado winter on the way. I grew up just outside of Chicago and we had an old pine tree in town that feral parakeets lived in for years. There were local stories and rumors about how they got there. So maybe the parakeets might survive the winter although Colorado is a lot colder than Chicago! Your post put a smile on my face! And brought to mind a fond memory of seeing a flock of white pelicans along the Columbia River at the former Crowe Butte State Park (WA). Our daughter's peahen escaped. Later that fall our neighbor said he saw a strange-looking bird in with a flock of turkeys - pretty sure it was our peahen! All the geese get prettier at closing time. Big smile for that one, Montana Guy. Want to meet Joel Salatin?